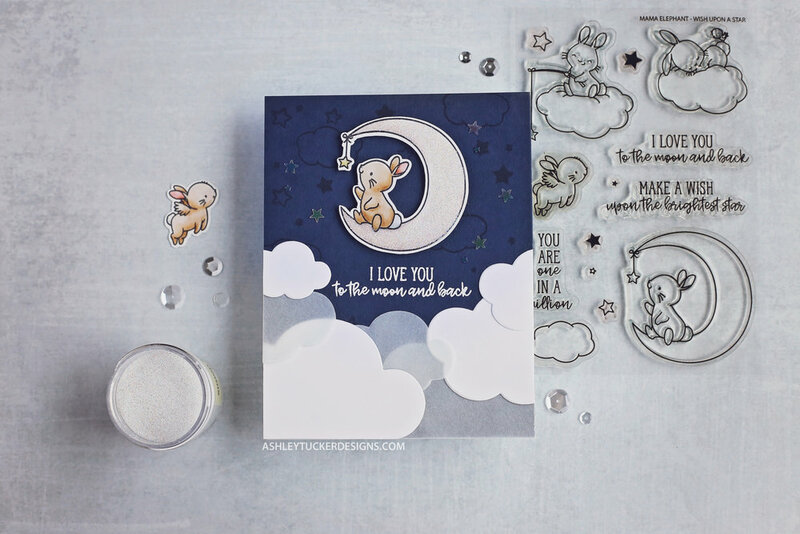 Today I am sharing a simple card using the Wish Upon a Star stamp set from Mama Elephant. I started by stamped the sentiment on a piece of Gina K Designs In The Navy cardstock with Versamark ink. I embossed it with Alabaster white embossing powder. I then stamped starts and clouds from the Wish Upon a Star set all over the background with Versamark ink. I die cut a bunch of clouds out of Neenah white cardstock and vellum with the Infinity Cloud die set from Hero Arts. I arranged them along the bottom of the background and glued them down with Gina K Designs Connect Glue. I then glued the whole panel to a card base. I pulled out the colored in image of the bunny on the moon. I colored it in in a previous video and then didn’t end up using it. I popped that up on the card with foam tape. I then went over the moon with Glossy Accents and sprinkled Unicorn Dust glitter over the top. To finish up the card I went over the vellum clouds with Wink of Stella and I added a few star sequins to the background.